NEW YORK (May 28, 2018) – FlightSafety International announces that it will offer training for the Pilatus PC-12 NG aircraft at its Learning Center in Denver, Colorado. This will be FlightSafety’s third PC-12 simulator and second training location. Design and manufacture of the new FlightSafety FS1000 simulator for the PC-12 NG aircraft is underway at FlightSafety’s simulator design and manufacturing facility in Tulsa, Oklahoma. It will be equipped with the Honeywell Primus Apex avionics suite and incorporates synthetic vision. The simulator is expected to be qualified to Level D and enter service this fall. The simulator will feature FlightSafety’s latest advances in technology, including the CrewView collimated glass mirror display and VITAL 1100 visual system. CrewView provides far superior distortion-free optical performance with greater clarity, sharpness, and brightness. The glass technology provides a true spherical shape for exact geometry across the entire viewing area. VITAL 1100 significantly enhances training by providing highly detailed mission specific imagery with vastly improved scene content and exceptional environmental effects. Training benefits also include a whole-Earth environment and worldwide database that incorporates latest terrain information with geo-specific satellite images. Training for the Pilatus PC-12 and PC-12 NG aircraft is currently offered at FlightSafety’s Learning Center in Dallas, Texas. The Center also provides training for the new Pilatus PC-24 Super Versatile Jet. Pilatus selected FlightSafety as its factory-authorized training provider for the PC-24 in 2013. Training began in January 2018. 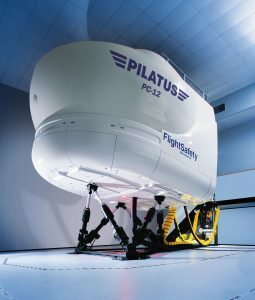 FlightSafety’s Denver Learning Center is equipped with Level D qualified simulators for the Airbus Helicopters AS350 B3, EC130T2 and EC135; Bell 407GXP; Bombardier CRJ 200 and 700; and Embraer E170 aircraft.